The update to Polaris Office on my Galaxy S3 is inferior to the previous version. It has at least a serious problem. The SUM and SUMIF functions do not work on rows 1 to 4. All ranges will return a REF error. Waste one whole afternoon trying to figure out where I went wrong. Finally decided the app was faulty. I discovered that my daughter had installed Google dictionary on her browser and so I went searching for a CL dict and found this one. Would be quite useful to recover and improve my CL. Nestled next to Zhongwen is the Google Dict. Didn't the PM say he will throttle the inflow. At current rates, we will have 6 million people here within five years. No, they cannot allow such a huge influx. You don't even need to do any calculation to know the infrastructure will not cope. I think the population growth would have been much higher going by what several friends have told me how impossibly difficult it has become for their companies to bring in PMETs. 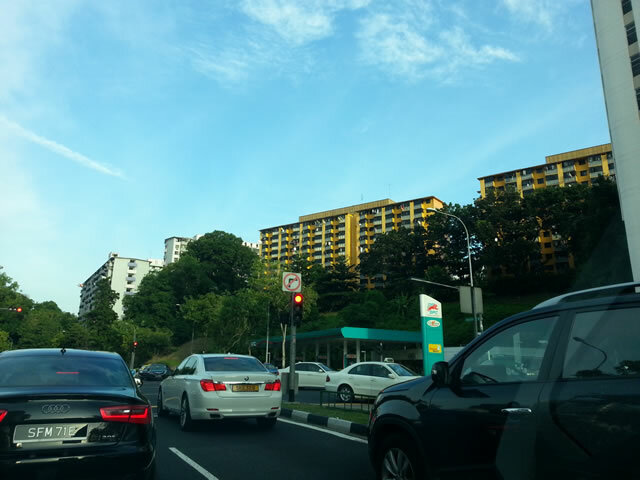 Singapore as become a very desirable destination since the G successfully put us on the global map. A good guess is a huge number of people which we had not seen before must be knocking on our doors to get in. After all many other cities are facing legendary problems. They lose their jobs, they want to be here. The discussion has lost its focus on how our growth is predominantly input led than productivity directed. This is poor quality growth. We cannot keep going this way. A hiatus though painful may be what is needed for longer term and less costly growth. Carrefour @ Suntec. Practically empty now and only one checkout is in operation. I didn't go in to see what is still available for sale. Once users feel insecure even if they don't leave they are likely to play is safe. Facebook will lose. I never trust security that is not in my control, i.e, facebook, Gmail, Blogger and even internet banking. This is the reason why this blog is not made private which is what I much prefer. Early this morning, received this notification that an old friend dad had passed away. This is a good way for the family to say good bye to close an important chapter. Many of my friends have similar farewell experience with their departed parents. I was never so "lucky". There must be quite a few like me but I don't personally know them. There are also some whose parent passed away as unbelievers e.g., my former pastor. He grieved for many years, but by and large most seem to just accept it. A parent's death is a complex experience which perhaps takes a lifetime to sort out. Most people don't talk about it and I think partly because they don't know how to. Lobbing back at Cecilia Sue with these SMSes? What was privately sent in affection is now publicly declared with hatred. Everyone is trying to protect their reputation. It used to be if you lose your reputation you have lost everything. It is a given especially when it was done in secret and now put into the open. People will not be consistent, they will be untruthful. I prefer not to say lie. They are under a lot of pressure. For shorthand, like how Adam and Eve must have felt when God came looking for them after they had eaten the forbidden fruit. I tend to be kind in such situations. I look for opportunities for redemption. It will take time. It is truly amazing how somethings done most secretly can feel so right but becomes utterly wrong and shameful when made public. This is us. The rest who aren't caught are throwing stones. Did I spy nine comments? There will be more. So how do we understand this? It took me many years to understand and I am still learning. It is about our pride, our egoes. There are many ways to look at this that it would use up a book to write. Now that the whole thing has been exposed private lovers become public enemies. Why did God choose to use the metaphor of a marriage/love relationship between a man and a woman to communicate his love for us? The Lord used my first love to teach me the nature of his love and I have been in his school ever since. I never graduate. There is so much to learn. What marvelous grace. Mother Teresa is one of the top students in this school. They say charity begins at home. I recall my late mom used to chide us that we wouldn't understand how she feels until we have children of our own. My late father preferred that we pay it forward: in the love we give to our children. Filial piety to him is a bankrupt idea. He was right! Between leaving home and having children you get married. You learn to love with the person you marry then you learn to raise your children afterward. Prior to that you learn to love with the girl friend or boy friend you have. In this sense, those who are lucky to get it right do not have many girl friends or boy friends before they settle on the one to marry. This is now a rarely trodden path. The work of the Devil is to destroy the family. Looks like he is succeeding. When you betray your spouse, it is designed to hurt as deeply as we betray God. You do not know what love is because all the love was self directed to feed the ego. Lust is just giving power to the ego, worshiping the self. It is an abomination to God. That's why before Amazing Grace came, the guilty were stoned to death. When the ego is denied its food it is time for redemption. I have written less than 1% of what is on my mind. No student interviewed was aiming for RGS or RI. I thought they were managing their expectations pretty well. It would be much worse if they were that ambitious. I think there would be more disappointments among the top and GEP classes when the PSLE results is released. It is the parents of students from such classes that make the most noise. On the darker side, the kids and going by their testimonies the parents were clearly under stress. Should we continue to let our kids live this way? Until many of them even lose the interest to play and laugh? The trend is not helpful. When are we going to say enough is enough? We will get there and if the leaders have any foresight, they better be thinking about this since yesterday. By the way, it would be terribly helpful to be less fear mongering and inject more positive energy. And I just come across the PM's response to PSLE pressure. I thought he had within our box answered well. Thinking outside that box, I think we should scrap the PSLE and differentiate ourselves from our competitors. We should allow for more experimentation and diversity such that there would no longer be a standard PSLE but different versions which cannot be compared with each other to be ranked superior or inferior but tailored for a better fit to a child's strengths. This will reduce competition but paradoxically also raise standards. E.g., I imagine some will take heavy maths and science paths leading to NUS High. Yes, scrap the GEP. Some will focus on something else e.g, music and end up at SOTA or some other secondary school which is extraordinarily strong in music. Let a thousand flowers bloom. Different secondary schools will accept or prefer some versions of the new PSLE. We want to create happy learners, not "I am better than you" learner. Everyone wins in their own way. There is no more a single idea to success: the T-score which you can rank the entire cohort. A child will only be ranked within his or her special PSLE. Now if trying to place the kids out to secondary school from 13 years old is too soon, then we do it later. Don't be a stick in the mud. Be flexible. Do what's best for the kids. Cater to their unique combination of strengths. I agree with the PM that the importance of the PSLE to a child's eventual success is over rated but I think too many people will learn that he is right the hard way. There is just too much fear in our society. The stress that arise from a positive energy is healthy. Any stress that comes from the fear of losing should be discouraged. We will need an entrepreneurial mindset across many types of careers tomorrow. A childhood immersed in negative energy cannot produce the shrewd risk taking habit. I want to see a future where the street cleaner is a Singaporean who is highly educated and well paid. He does his job like it cannot be done elsewhere. The skill, knowledge and technology he uses is of a very high order. You find no reason to look down on him. How do we make this happen? It has everything to do with the strategies and environment which we educate him today. It is very important that we show our kids there there are many forms of success from a very early age before they are too set on these things. Well if I have my way, I would scrap the PSLE altogether but breaking up the PSLE into different packages is better than what we have now. This caught my eye when I opened the door to retrieve the papers this morning. I agree with MTI completely on this. I agree with many things the government is doing within their sandbox. And many things they do here if it were copied elsewhere will do wonders for other cities. Those places need them more than we do. We should just help them, give it to them and invent our version 2.0. The problem is we aren't. We are flogging Version 1.0. Translated it means some sacred cows must be killed and any of them killed only when the evidence is overwhelming and obvious would already be too late. That's why I say we have the best government in the world but unfortunately is not good enough for us. We do not have Steve Jobs courage to risk the music iPod with the iPhone. For Apple then to take on Nokia and the other mobile phone makers was a classic fool's idea. Nokia had all the technology to make the iPhone. They even had in house prototypes. We all know what happened when Nokia tried to protect its lucrative business. It lost the future to Apple. Closer to home, the story of SIA could end up as living the script of Nokia. SQ is an experimental vessel for the larger Singapore: the consequence of flogging an exhausted paradigm. Prof Tan KG is right that the government had shown courage to continue with their foreign workers' policy but that is only half the courage that Singapore needs. Such small courage are even difficult to find elsewhere and no credit to this government. Elsewhere are far more impatient. They don't complain too much. They just take to the streets. Foreign governments wish they could have us as voters but our government never hope to have theirs as citizens. What does that tell us? Stop blaming us and get on with doing your job better. Show me you have guts otherwise don't stop others who have true leadership from taking over from you. 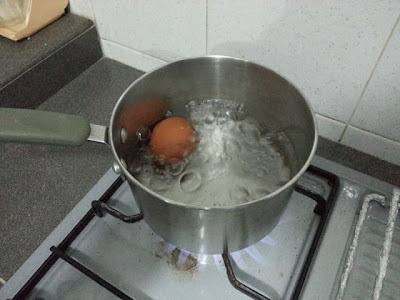 I made the right decision to forgo the sophisticated steamer and prepare a three quarter boiled egg the old fashion way: 5 mins after the water boil for a medium size egg. Come to think of it, I still do many of the chores the way I was taught or saw my late mom had done. They almost always work better. One of the stupid decisions I made at Pine Grove was to invest in a vacuum cleaner that also mops the floor. It was very expensive, and often tripped the power, i.e., a complete failure. The last two done at 5 minutes were less than successful. Perhaps the eggs we were using were bigger. I am going to boil it for 6 minutes this morning. Thank you Tony Pang for doing the talking for me! Exactly my sentiments. I am just very tired with this government. I didn't care to read what Lawrence Wong had posted to his page that had sparked all these discussions. I was curious when Andrew Loh wrote a commentary for Yahoo. Then I got interested and read more. Tony Pang is right that we are not stupid. In fact we might be among the smartest of smartest electorates. The only ones that cannot be bribed, who do not believe in such a thing as a free lunch. Countless nations have suffered and some have come to grief because they took the poison bait. How do I assess my leaders' hearts? I explained it at dinner tonight to my family. I told them I used Mother Teresa for contrast. The good Mother when travelling was always thinking of the folks back Calcutta and the other missions she had established. She was always thinking about her nuns and those they are helping and will help. As I spoke to my family, my mind were flashing F1 where more than a handful of our leaders were present. You think they were thinking about us? At best they were lobbying and furthering Singapore's national interests. Singapore as a macro idea and concept not as as breathing flesh and blood people. They are always thinking of making trade offs. There is no room for faith. Only managers think of trade offs. Leaders are unreasonable and always figuring out unconventional solutions. Only managers protect sacred cows but great leaders slaughter them to feed the army standing in the way of progress. Managers calling themselves leaders cause my eyes to roll. Leaders galvanize a people to get to a better place which they would otherwise not go. That is how we got here. Can they do this? Today they don't even know how to explain themselves properly. They stupidly pawn the trust away and now they can't afford to buy it back. Dissonance screams from our "leaders" talk and walk; thought and talk. How to trust them? But we have no choice. So we struggle to make do we them for now. We raise the bar for them and they throw tantrums like kids. That's why I have ignored Lawrence Wong diatribe until other writers have helped me along with how I am feeling and thinking about this. Probably the best government in the world but not good enough for Singapore because in nearly all instances our leaders have lost the much vaunted foresight they used to have. With Philip Yeo gone, the entrepreneurial mindset also disappears. While Dr. Goh protected and nurtured Philip and a few others, none of them were powerful enough to produce the next generation of civil or political entrepreneur. I quote Lim Hng Kiang from that article. Trade and Industry Minister Lim Hng Kiang said foreign manpower is needed to complement Singapore's resident workforce, and support the construction, health and social services sectors. He said foreign manpower is also needed to anchor and build up new sectors in Singapore -- such as the biomedical and aerospace industries. 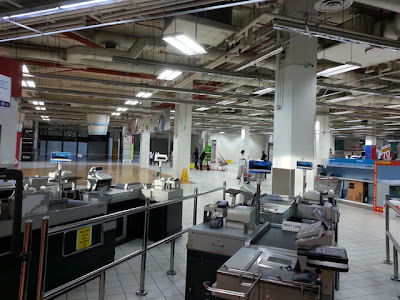 Mr Lim said: "If you train Singaporeans to fill up the sector before you launch the sector, you may lose the opportunity, and you take too long. 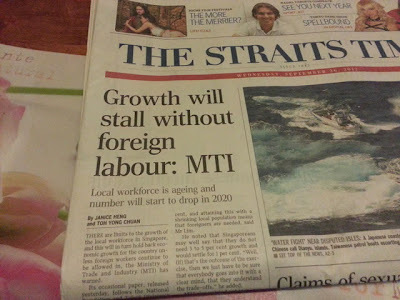 "So our strategy is to bring the sector in, allow the companies to hire foreign talent, workers, and meanwhile we train Singaporean workers to fill up the jobs. If you tell Rolls Royce, wait until we train all the workers and technicians, I think we would have missed the investments." Much as the government try, it is not able to put Singaporeans first. This government is the envy of the rest of the world but Singapore is not like any place in this world. Here you see a case for putting Singaporeans second or there is no place for us at all. I recall Lim Kim San making the bold move to containerized our port before it was obvious that's the way to go. That's entrepreneurship in public service. Lim Hng Kiang and his colleagues are clueless about tomorrow opportunities, so we cannot prepare for them. I am not explaining it here now because I need to get on with other things, but I am sure we are over paying our ministers beyond the threshold where we get under performance instead of over performance. We need not go further than looking how over paying CEOs have caused large companies to do badly. There is now a ton of literature to prove that. So what is this government trying to do? They are not reinventing Singapore. They are only trying to make this place last as long as possible and the longer it stays with their paradigm as seen in the sacred cows the harder it is to make this place work until we are all totally exhausted. If they are not prepared to defend each sacred cow to their critics which the future of this society depend on, the national conversation is a waste of time. I have better things to do. If twenty years from now they cannot safe guard this place, I will have to at least think up ways to protect my family and network. There is no evidence they are up to this challenging task and as we approach D-day more and more people will realize that. Unless the external environment is benign, I estimate that within ten years problems will appear and grow faster than they can solve them. I was chagrined by ST one-sided view of the F1. All upside and no downside. Nothing man made is so wise that is all positives and no negatives. Well they think the pluses negate the minuses to the extent that you can drop mention of the undesirable consequences? I will wait to see if anyone would propose the negative secondary effects. Look deeper and you will always find them e.g., prostitution. At least the ST is not thick skinned enough to omit the quotes. I could have picked from countless pics but George Yeo provided one of the more interesting ones. F1 brings global elites to our shores. They will go back with a very good impression. If we can get them to think about us, some will eventually do things with us. This is positive. A possible negative is secretive film crews coming here to make more pornographic movies. Well you open the window for the bees, you also cannot stop the flies and the damn cockroaches. This came from the latest issue of the Economist. I noticed in the ST article the Japanese were not a big presence in our F1 event. Concomitantly, Japanese society is the furthest along in losing their love affair with wheels. 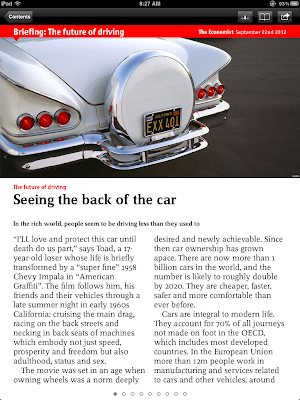 Perhaps the next five years will be the final tie up with F1 as the global infatuation with the automobile wane and they become a transport utility. What would succeed the sexual need now met by the car? There is a huge economic opportunity there but not one I am keen on. My wish is not to see a less able government telling us we have no choice and has to buy into such options. Meanwhile roll the red carpet for the driverless car. I am really looking forward to that. It will markedly improve our quality of life. My guess is that we can probably accept the negative secondary effects from F1. It should be temporary. My worry are the longer lasting tertiary effects, which is hard to pin down and potentially insidious, e.g., the erosion of our values including those that had taken us here. Five more years and afterward I hope no more F1 here. This came in the mail this morning from a friend in Vancouver. I haven't seen it before, and I think I have received quite a few especially when you get so many repeats. This is a very well done production too especially when it was made for Animal Planet. Such stories aren't unique and I feel they are gradually changing my view about animals. Godaddy.com used to be the price leader, but over time their rates have gone up. I wonder if I should make the move to another service provider. Now I always have to wait for at least 23% discount or more with no minimum purchase just to get my old prices. Most of their offers are like the one you see here. I would welcome Gmail to get smarter and send them to spam but let the best deals through. Some days I am reminded more than most days that we really try the Lord's patience with us. Even if we dare to talk about how others are trying his patience, we are immediately reminded how Daniel prayed. He included himself with his people. The non-believers around certainly do not see it this way. Mostly they ignore us. Some think we are hypocrites. I wished purported believers would realize and be frightened, but the Lord's patience knows no bounds. I thank God for Desmond Tutu, Mother Teresa and many less well known names that I am fortunate to come across. From across space and time they reach over and show me how to read my Bible. Wonderful pockets of grace that pierce the black clouds like stars scintillating in the night sky. As for BSF? What's that? If you don't grow in grace, I can't tell but it is wise to ask if you have been made alive by grace in the first place. In our times Mother Teresa was a standard bearer. She never judge anyone because as she explained, if you judge you have no time to love. What is commonplace today is performance Christianity; not grace founded Christianity. That's why the staunch Christians often keep to the safety of their social circles where they can live their theology. They wouldn't know how to be Christians otherwise. When you grow up from Romans 8 you will find Romans 9 waiting. Samsung is nothing but tenacious and thorough going after Apple to grab market share from the iPhone. I found this little card in my Galaxy S3 box. First time I accompany wife to her company doctor. Three days medical leave for her badly bruised foot. Makes me wonder how one can be so badly hurt accidentally walking into that light weight sofa I regularly kicked and push around during house cleaning. That piece of furniture is going to acquire some new respect! 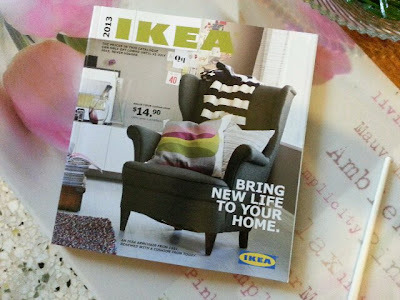 Ikea 2013, nice! They used to be bigger. Wonder why they have shrunk it. Everyone likes to see larger pictures don't we? We look forward to getting a free copy every year. Had been getting one since we moved to Pine Grove. 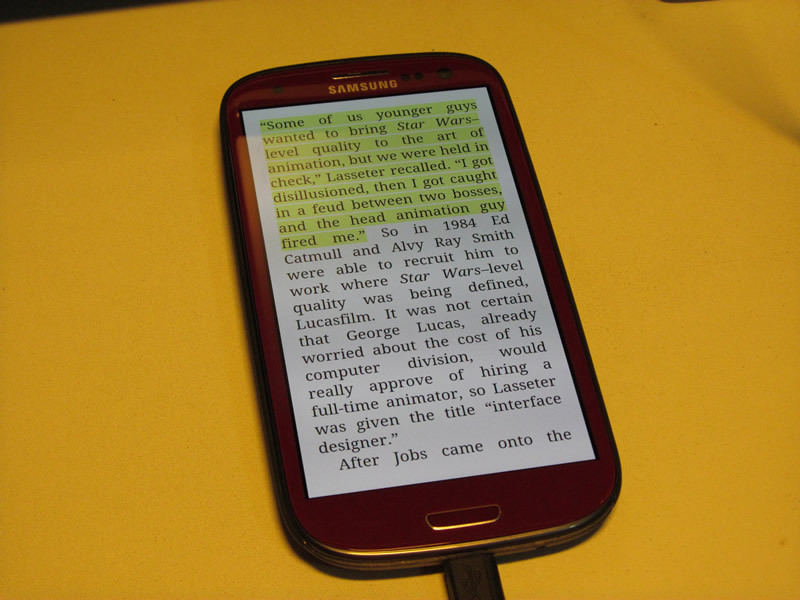 The Kindle Paperwhite looks good! Since I already own the Kindle Touch and Fire there is no reason to pick up this one. It would have been more cost effective as I use the Fire only to read at night. Zhou Yongkang helping us with social challenges? What's there between China and Singapore to learn from each other how to deal with social challenges. Look at his abridged resume in wikipedia and compare it with what Teo Chee Hean said. SINGAPORE and China can learn from each other in dealing with common social challenges such as widening income gaps and ageing populations, Deputy Prime Minister Teo Chee Hean said yesterday. What does he know about widening income gap unless it had gone so far to be threaten social stability like he had to deal with. What does Zhou know about ageing issues? I imagine anything our government can pick up from the Chinese is inimical to our freedoms. Perhaps this government want to learn from their experience and obtain any technology they might have developed to more closely monitor and control us. If we don't see any Chinese methods used on us then it could be held in reserve as Plan B? When we are in a deep social crisis and courage fled our leaders; when courage dies, faith evaporates and only fear is left; Plan B will be rolled out. Post 1989 China learned from us to invest in anti-riot principles. Today they have surpassed us. Fast forward 2012 it is anyone guess what we are picking up from them. I can't figure what they can learn from us managing "social challenges" when they would love the docility of our society: no problem at all! How they rue and wish Hong Kong society is more like ours. I think the change of mindset Lawrence Wong talked about would take about one generation to happen. By that time lots of people will learn that PSLE and even the A levels; frequently the university degree too are not sufficient and may not even be necessary to be materially well off. The Chinese and Koreans are ahead of us in this game. Soon it may even become fashionable to label a jobless grad a fool. As our economy becomes more sophisticated and diverse, meritocracy will take a backseat to luck. That's why it is often said that who you know is more important than what you know. Warren Buffett went even further with his striking lucky in the ovarian lottery. What happens when meritocracy fails to deliver? Who is thinking and preparing us for that day? The Spring shoots for a new society where luck counts more than merit are already visible. Kiasu, kiasi parents are barking up the wrong tree and wasting their children's time failing to prepare them for tomorrow. Meanwhile savvier parents who mostly were the winners of the last meritocracy are quietly noting the shortfall in the system and have the resources to direct their kids appropriately. This is our version of the ovarian lottery. The PSLE problem will reach a natural expiry date because of the fallacy of belief as explained earlier. To avert luck from trumping meritocracy, a superior government must do away with the PSLE by executive decision rather than leaving it to expected disillusionment. Unfortunately this call for courage that this government do not possess. To be fair, they are already more courageous than most governments today but not good enough for our longer term security. Abolishing the PSLE and introducing the sort of developmental programs that savvier parents are arranging for their kids would strengthen meritocracy. The risk to the government is that we might not show up well in TIMSS rankings. You know how this government obsess how we are placed on international benchmarks but do not seem to question or qualify if these league tables make sense to our circumstances. Those benchmarks saddle us into the fix of the good becoming the enemy of the great. Others can get by being good especially when they are often mediocre, but we need to be great to survive. Pockets and episodes of great work we display are not infecting and growing across our economy and society. Why? Because we are elitist; because our PSLE and educational strategies produce a small core of great elites (debatable) and lots and lots of the struggling good who are overworked and over stressed in a hyper competitive world. If we stick with this present system, we will all have to tire ourselves out putting more than a day's work every day because instead of trading a horse for a car, we are just flogging the animal harder. The PM always tell us to work harder because it makes his job safer and easier. When his government cannot do better, it naturally fell on us to do the heavy lifting. Foreign governments should be admiring us rather than the government. Just do a simple what-if, i.e., if they could have us for their people rather than what they have. We are so easy to govern despite being a querulous lot. We make a lot of noise but other people are faster to vote you out of office. Most important, voters elsewhere believe in getting a free lunch but we are always suspicious of such promises. What's the matter with archbishop Nicholas Chia? What's the matter with Catholic archbishop Nicholas Chia? When explanations get complicated I get suspicious. I prefer the simplest reason like Xi Jinping actually hurt is back and so was absent for two weeks. Conspiracy theories are a waste of time which human ears are unfortunately always itching to hear. I think the archbishop courage failed him. I don't buy the government line that this is about mixing religion with politics. Function 8 is about politics do not square with me. I have been left wondering for a long time why MHA didn't act against Teo Soh Lung (look! even Wikipedia has an entry about her, I just checked google in order to spell her name right) despite her very public speeches that she and her compatriots were wrongly detained under the ISA. What about Lim Hock Siew? The government never responded to his accusations that he was wrongly detained and for decades too. To me the whole issue is about miscarried justice - the simplest guess. It also show me when you peel away this government though very able is like governments elsewhere. Power is dangerous and unchecked power even more so. By and large the folks here do not pay much attention to these issues. They tell themselves as long as they don't get involved in activities like these men and women the ISD will not come after them. I feel the same way too but nevertheless I am grieved by the lack of accountability and apparent injustice. Well LKY in an interview with Charlie Rose didn't claim that he was never wrong about these detentions. He only defended himself that his motives were honorable. Perhaps after LKY is gone, we will then resolve this. Time heal all wounds. If not enough of us move beyond bread and butter issues before we are overtaken by unpredictable crises, Ben Franklin admonition will ring true. While the Thanksgiving turkey was scrumptiously fed, it didn't know until a day before it would Thanksgiving dinner. Our system by and large works but it is fragile. Are we forced to trade it for something that often may not work but is resilient? If we run from fear, it will have a way of catching up with us eventually. I read Seth Godin's very short book (only 96 pages) "The Dip: A Little Book That Teaches You When to Quit (and When to Stick)" yesterday. I would like my kids to read it after their exams which is happening next and the week after. Today someone put this up on facebook. What serendipity: Failing unitl you succeed. They don't teach stuff like these in schools. Those kids with better informed and interested parents get a leg up. Dinner at Watami tonight with wifey. I shall start with the end: we are not coming back. The quality is so-so. Price is reasonable but the portions are tiny. Any time I would rather go to Ichiban Sushi and Boshi. The service staff are extremely polite but pretty ineffective and clueless. Clearly they are not properly trained. 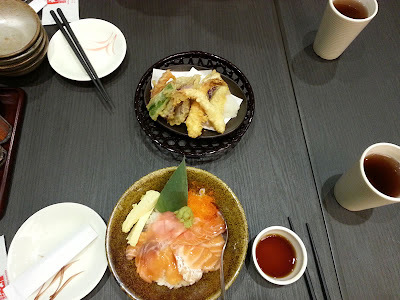 Also the Tempura Moirwase took almost half and hour to come after the Salmon Don was served. We had to chase them thrice. 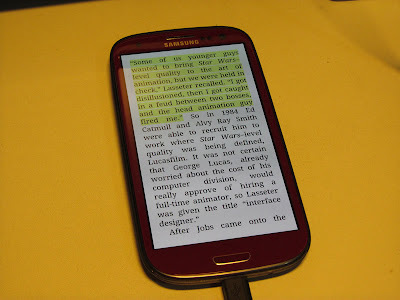 The way Kindle fix their app on an android phone is a hacker's paradise. I get so much flexibility with moving and managing files around. Perhaps combined with Dropbox, I might be able to get it to synchronize with the Kindle on the PC. No time to figure that out yet but I have some idea how it might be achieved. 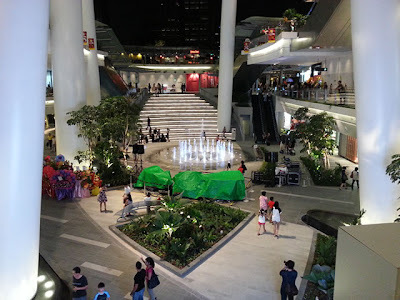 Took the opportunity this evening to check out Star Vista which was opened to the public two days ago. I think it is a mistake not to have air condition. The place was uncomfortably warm. 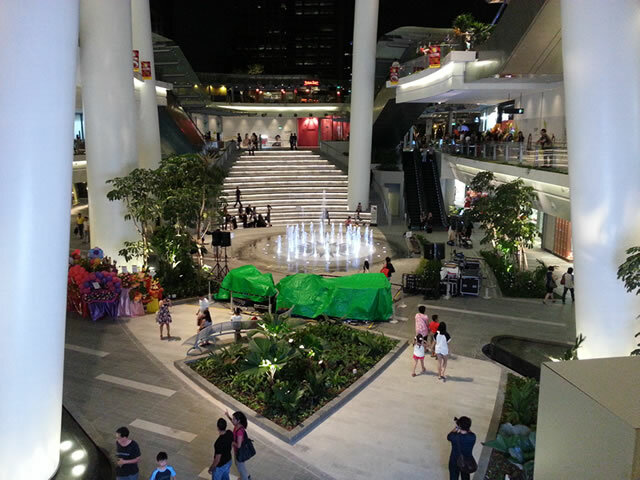 As the mall sits next to the MRT station, access to transport is pretty convenient. Most of the shops are opened yet. 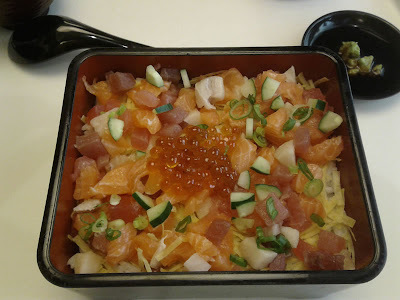 Watami Restaurant looks interesting. We will try that out sometime. It is hard when the others like something else. Since I am not a fussy eater I usually went with what they want. Again I am reminded to avoid TNP. Esther Ng the journalist who wrote this article had handled a topic that was beyond her ken. As a result it had made the Education Minister looked bad. The issue here is the relationship between dyslexia and memory. I am familiar with dyslexia, the DAS and their intervention programs, which failed to work for my daughter. In our society special needs kids are often inadvertently made to feel unwanted. If you have kid that is severely dyslexic, you carry a heavy burden because the academic pressure is much heavier. I sympathize with Madam Ong trials. The minister had said: "Dyslexic people are not forgetful." 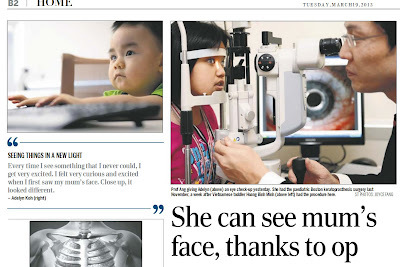 But Madam Ong maintains: "I never used my son's condition as an excuse, I was merely pointing out that he's forgetful." 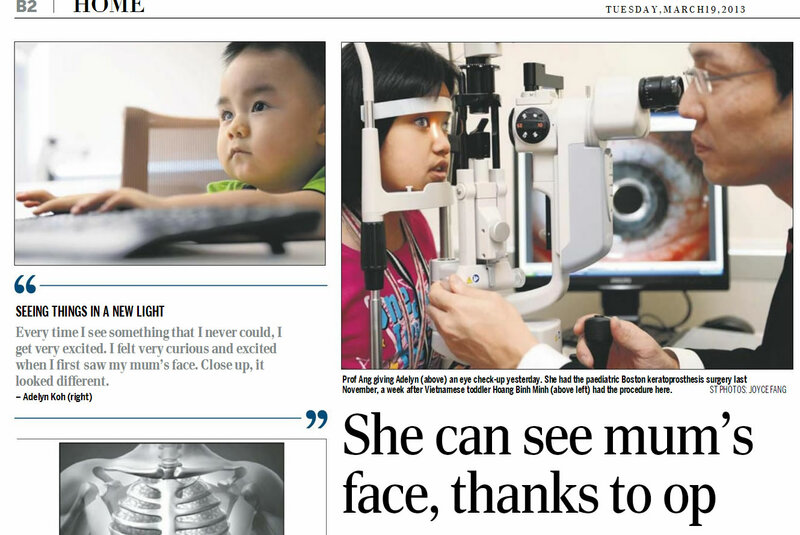 Ms Cara Tan, 25, a teacher from the Dyslexia Association of Singapore who has taught Madam Ong's son for three years, told TNPS that "weak memory is one of the characteristics" of a dyslexic person. She adds: "It depends on the severity of the condition - there's a whole spectrum from mild to severe. "In the case of Madam Ong's son, he leans towards the severe, especially in literacy and memory. "He's 12, but his reading and spelling age is that of a nine or 10-year-old. "One of his biggest problems is memory. "He can't remember a number of words even though he's read them before. I realise I have to teach him how to spell it a few times." The article makes it look like the boy was unfairly judged because he really had problems with memory. However the writer needed to be more precise. The boy poor memory is over words and not objects. In this instance the object is a letter from the school to be shown to his mom. Min Heng is right that dyslexics aren't forgetful but they can exhibit specific forms of poor memory. This article had painted the minister as intolerant and unfair, which I don't think is true. This is sloppy thinking and reporting from TNP. 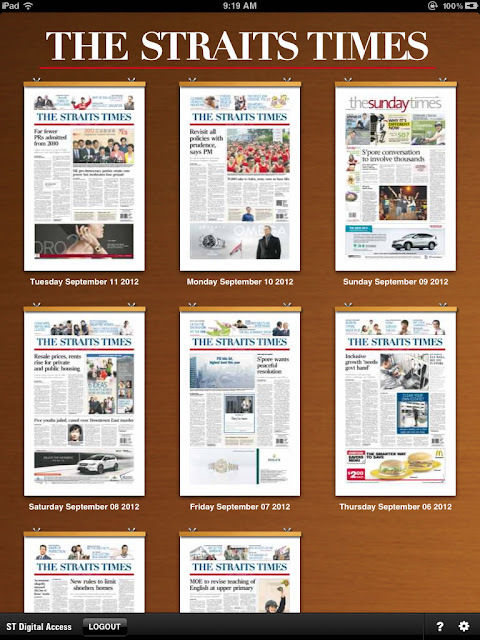 The opportunistic TNP was just indulging in low grade journalism and insulting the intelligence of its readers. Clara Tan from the DAS must be pretty unhappy to have her professional input misused this way. SPH should train reporters from the TNP better especially if they are read by less thoughtful readers who are at risk of being misinformed. My daughter WhatsApp me this yesterday. She didn't noticed these lovely blooms when they were still making the tree look pretty, but it is still a lovely sight to behold when they had fallen off. She rarely pass here and that's perhaps when she hasn't noticed. 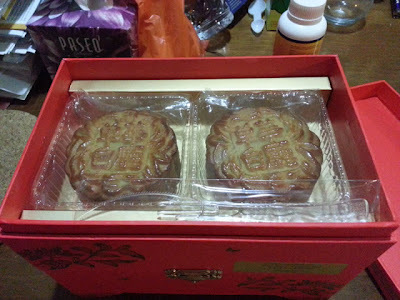 Here's our first box of moon cakes brought back from the office last night. Again I am reminded those who don't want or need very few of this item often have too many. Those who are not suitably connected in the lower income group have to pay up to buy it from the shops. May be I should just go and watch who buys them; at the neighborhood shop and also say Bengawan Solo. 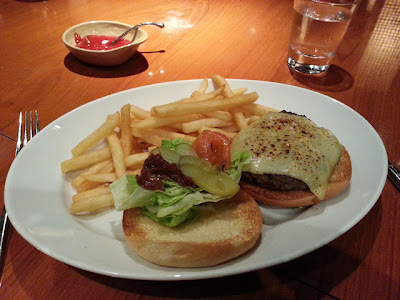 Lunch was this Wagyu Cheeseburger at Mezza9 Hyatt. Just too heavy for me! My ex boss who brought me here finished her portion. Amazing how she must have turned them mostly into CO2 and water. On the other hand I have a smaller carbon footprint. My first pic posted here taken with my new Samsung Galaxy S3. 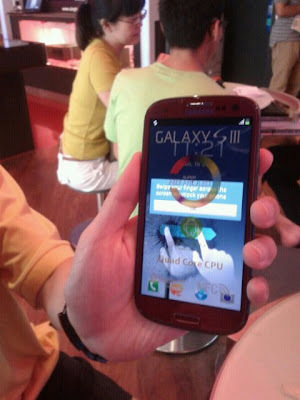 Traded in my white Galaxy W for a Galaxy S3 at Singtel Shop @ PARCO Bugis earlier today. 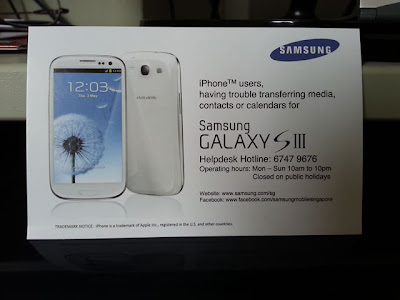 My journey with smart phones began with the Galaxy Ace. That lasted for a year before I swapped it for the Galaxy W and now this. It took me a long time to recognize that a mobile phone is no longer just for talking into and texting. It is now a critical device. After the kids' are done with their exams, they would have their smartphones upgraded too. May be wifey would opt for the iPhone 5? but their price plans is a waste of money. Would be good if all of us on on the Galaxy S3. The most successful in school and in life are increasingly like this. Only a few exceptional ones have the confidence to go beyond themselves and help others. We have taken competition to the extreme. We are not becoming better by competing this way. Beware of the Tragedy of the Commons down the road. I am glad Heng Swee Keat recognized this. We have been complaining about this for many years. We are fortunate that our kids never needed to compete this way to do well enough. They could have been among the best even the one with disabilities but what for? That's a tunnel vision of life and truly myopic. It also smacks of too little faith and hubris that success can be engineered. I wonder how long enough people will realize the futility of competing this way. I hope we do not learn the hard way. Competition which weaken social bonds is stupid competition. The rules and habits of how people compete to get to the top must change or we become dysfunctional like many other places. What intrigued me is that the writer was a psychiatrist. If his family has problems coping with school pressure, there must be many more who are finding it excruciating to endure. There is also no lack of anecdotal evidence from his patients to bolster his case against unhealthy stress in schools. I am so happy my kids are done with the PSLE. The stress then was manageable and I think it helped that we do not press them to be top students. Overall they did credibly getting into a high band secondary school and the elder child did very well for her Os. I wonder what it must be like if our kids are still caught in primary school! I am reminiscing how tired I felt the last time I took a look at the latest PSLE assessments books at Popular. I couldn't tell if they were more difficult than the ones my kids used, and they used the hardest we could find. I just could feel again how tired we all were. The main reason for that wasn't because it was difficult but there was no joy studying and gaming tests. I wonder if I may use as an analogy how magnets are made to reconsider the PSLE. We know that if you expose steel persistently to a magnetic field it eventually become magnetic even after the external magnet is removed. Perhaps we are too afraid that if we remove the PSLE, academic standards would fall. I think the drive to strive hard to achieve high academic scores could already be ingrained in us. We cannot do away completely with major exams but may be we can add more years between starting school and when the big exams are due. People worry less or not at all about the distant future. We can arrange this by simply giving up the PSLE. Denise Phua in her facebook post said listening to Min Heng presentation, she felt that is where we are eventually headed. Well threatened and frighten this sacred cow till it is pallid and weak in the knees. Grow the courage to kill it. We should always learn to live with confidence rather than in fear. All sorts of fears (kiasi) are breeding and reinforcing negative energy in our society. This is no way to live. Even tribal people who live more dangerous lives are not as negative as us! If all schools can become good schools, we do not need elite schools beyond NUS High, SOTA and the Sports School. If you want to preserve Raffles and Hwa Chong, you could reestablish them into institutions where pupils compete to be exchange students to those schools for a couple of years whereupon they return to the schools they come from to take their major exams. This is adapting the exchange students concept in universities. Such alumni of Raffles and Hwa Chong could stay in touch informally especially with infocomm technologies. There is nothing to stop them from self organizing to create wonderful outcomes in a Complex Adaptive System fashion. That is what highly motivated and smart people do naturally. If we have the courage and confidence to slaughter our sacred cows we have a bright future compared to the one dominated by fear. With our tired paradigm, we have had to expend considerable resources to produce so little results. Time for some creative destruction. The recent lesson of how Nokia lost their position to Apple is instructive. We must have the courage to eat our own lunch or someone else would, and this is not a matter of if but when. 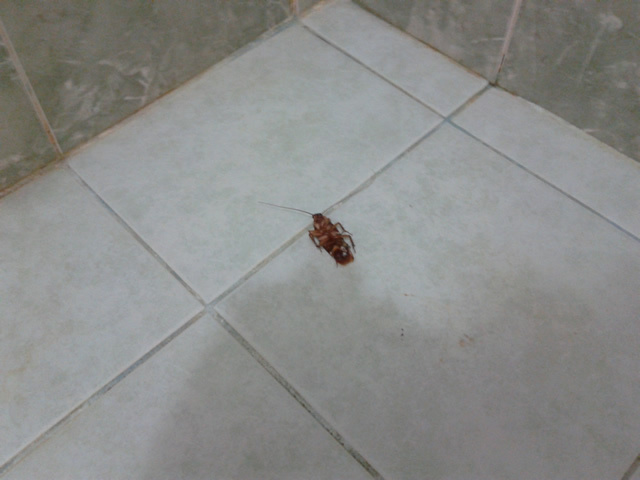 Just dispatched the fourth cockroach of this year. Why so many? The third one was about a month ago, and the second in this bathroom a month before. Where on earth did they come from? Our place is quite high up. They fumigated the chutes recently too. We were at Holland Village this evening and wanted to go to Swensens but discovered that its premises had been taken over by Xin Wang. We would have been happy to eat there but they are still in the process of fitting out the restaurant. 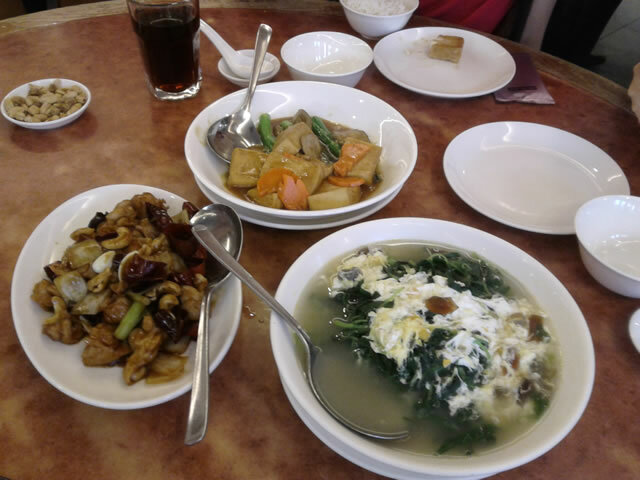 So we went over to Crystal Jade instead. I think we have not been here for perhaps almost 8 to 10 years? The place looks quite worn but the aircon system appeared to be quite new and that's important. The food is no longer very salty as I remembered them from the last time. This is good. 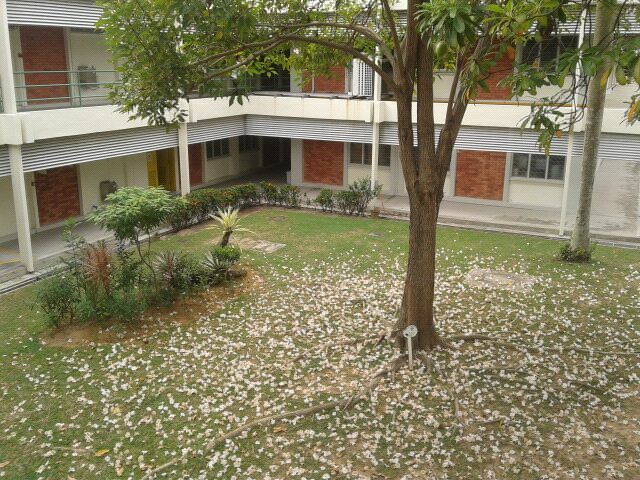 Every school is a good school in Singapore because none of our schools are failing schools. As in everything, they all can be better and that's what count. I welcome the removal of school banding. Schools can and will still be informally banded, e.g., you can go to kiasuparents.com and the time tested word of mouth to find out about the good schools; good in the sense that these schools are likely to help your child to achieve a good L1R5 for JCs. So what is the good of stopping school banding? The benefit is that school behave according to how they are measured. By scrapping the numerous awards, schools are now freer to exercise their judgement and initiative to do the best for their charges. Previously we were all serving KPIs. Nothing wrong with KPIs except that over time exceeding KPIs become the be all and end all of running schools. Managing a school this way is as egregious as kids studying to the test today. We end up self deceived thinking that we are far better than we truly are. Min Heng is doing the the right thing to cease school banding. Until schools game or abuse the system, then it would be time to make major changes once more. We see this happening to subject syllabuses too especially for languages. They are rightly making it harder to game the tests. Parents would be unhappy but that is the right thing for our kids. When I started this "blogging for myself" I thought nobody except my family would be interested to read what I might share here. I didn't lock this blog because I don't believe there is real privacy online. I would just have to be careful with what I write. Since this blog has become fairly popular, I am going to leverage its traffic to help Adelyn raise money to support her operation. Her story can be found in Your Health. Details on how to buy her CD is in the story or in Adelyn's blog. Thank you in advance for your help. We will be supporting too. The Internet is fertile with serendipity. You never know where it will take you. Be bold and imagine! Of course with such overwhelming response, I didn't get the chance to buy any. Good for Adelyn! Leaving France because you are one of the richest man in the world and you are about to be taxed at 75% ? That is what LVMH boss Arnault is planning to do. Too bad that we need one country to do something stupid and it happen to be France to warn the others not to try the same. There are a few more populist but damaging policies which are difficult to persuade voters not to entertain. Like before it would be perversely helpful some other countries try them so that we will not. C'est la vie or Such is life! How to trust the Chinese to engage the world and build confidence with the rest of us if they are so secretive? Hide and Seek are for kids, but this is China and such behavior is consistent with its long history. I am watching if there will be a China discount or people are just in denial especially foreigners. Lots of speculation, some would be correct but we don't know which one. Those who are in the loop, their lips are sealed. China's rise is not inevitable. The more confident they are of their ascendancy, the greater the risk they will meet with a big fall. Hard to take long term bets on China. Never put all your eggs there because unknowable risk is part of the system. ST needs to do better with their iPad app. Look at the time and the Wednesday edition hasn't come in. Many foreign publications built their apps better and are more generous with their archives. This is that time of many such and other lapses that I decided to finally put this up here to track them. And the app still crash pretty often too. Update: 11:30am I just boo booed. Today is Tuesday! Yes, I will get my Wednesday edition but only tomorrow! I read Soros' article "Why Germany Should Lead or Leave" in Project Syndicate a couple of days ago. To me he makes sense but as a speculator and not a politician as that would be unrealistic. All over the world including Singapore, it is hard to find political leaders of great courage these days. Other countries can get by with disciplined and realistic leaders. I am not sure such leadership is good enough for Singapore in the long run. The world today is more dangerous than the one Venice faced five hundred years ago. Foreigners cannot understand why the more thoughtful among us are so demanding on this government. Singapore is in a uniquely vulnerable position. But it is good that many of them don't get it or else they might be nervous putting their money here! LOL. Not all are so ignorant, some very smart ones know how to manage their risk in Singapore. For them to think we are a querulous and ungrateful bunch is a small price to pay. Our investment horizons are longer than theirs and we do not diversify our risks as they do. What would a young and vigorous LKY do if he was the German Chancellor today? You get the idea? In my view the present government is barely able to keep Singapore safe. Meanwhile voters are making its job even harder by shrinking their policy space. Since they do not know how to bravely entertain ideas outside the box, they are hugging their dear sacred cows for false safety. Yes, safe in the short term but disaster in the long run. Therefore the National Conversation is a waste of time. It is their means to get us to accept their version of the increasingly "hard facts of life", making us more stressed and tired with a heavier yoke over time without any light at the end of the tunnel. "Moderating expectation" is an exercise of trying to get citizens to be more realistic after hearing our dreams and aspirations, which is not a bad thing if done right but sadly, they have never known how. So count me out. I noticed some like Yeoh Lam Keong had opted out too. There will be many more to come. What I like about Sam Walton, Henry Ford, Jeff Bezos, Steve Jobs etc., is that as imaginative visionaries they are actually realistic in a very unreasonable way. They are easily mistaken to be unrealistic while they were trying to build their enterprise. We must do the same or we shall surely lose our best and brightest to America. So much for the PM desire to moderate expectation so as to match his competence. I am afraid it is a recipe for eventual failure. So given the inadequate political leaders in Asia, voters respond with low TFRs, the ultimate vote of pessimism in the future, the slow suicide of their societies. I think this email which came in an hour ago is probably a copy and paste from Property Guru today. I have been thinking about the implications of dismal trade numbers out of China. What if the risk money that was put to work in normal times are now leaving China? Outside the SOEs small time entrepreneurs have never felt secure about their money. Why not take it out when it cannot be put to work making goods for export etc., Some of it arrives here and are willing to pay outrageous COVs. Seeking a safe harbor, foreign money will be supporting, even raising real estate prices for a while. I don't know if I am right but it would be interesting to watch. Not a bad idea to sell it to them and buy back cheaper later during a reversion to the mean adjustment. Happy times for real estate agents while dark clouds are hanging over most of the economy. You don't see it yet as this is a weather forecast. If my guess is right, it would be a headache for Min Khaw and the government because locals will still be 'traumatised' after he tried so hard to assuage their fears. 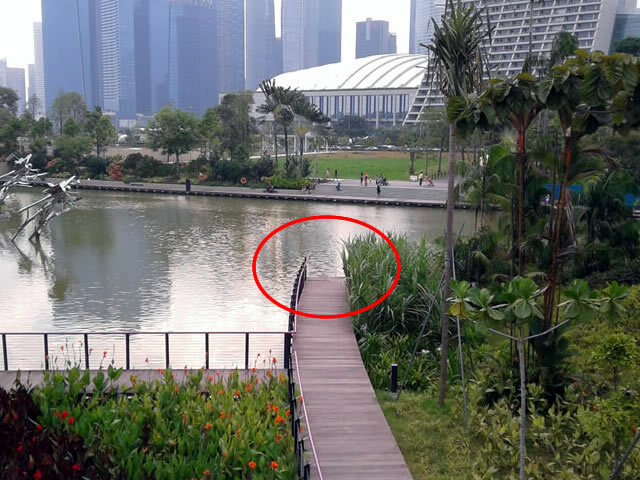 Don't be overly engrossed with your smartphone when you are on the boardwalk at Gardens by the Bay. You might go beyond the edge of the path and into the water! Good that the PM finally come clean that they would be preserving their sacred cows. It never made sense going by the way the committee for national conversation was constituted in the first place. Heng Swee Keat was talking beyond his book. Now he has learned that the electorate is more watchful and sophisticated than before. Raise the game PM. Don't take us for kids. Looks like we are never going to return to the strong people-government trust of yesterday. We are small or an industry of reading what the government meant from what it says will be born. The government prefer to play games with us when fear overwhelm courage while trying to deliver on their promises which is difficult. Difficult because weaker leaders first show themselves by over promising. Oh political promises! That would make us pretty much eventually like any other nation, especially the British since the structure of our government is modeled on theirs. For those who wish to have a quick education and have some fun at the same time, read the hilariously written, "Yes, Minister" and "Yes, Prime Minister". That's where we are drifting toward eventually but it might be worse if citizens are not vigilant. Truly had the PM headed the committee himself and sincerely wanted to examine and if necessary slaughter some sacred cows, I wouldn't have bought either. The National Conversation is the wrong platform for the exercise. Only an incompetent PM would do that. This exercise unstated purpose is to train young ministers in a hurry. They don't trust us to be open about their motives. They are often behaving duplicitously with us. So don't blame us for the eroding trust. At least allow us to make Reagan's dictum practical here: Trust but verify, or we are eventually going under because we cannot allow you to play god. Playing god, i.e, they know best what is good for us is one of the sacred cows. Keep this cow and eventually corruption will creep in and grow, a road paved with layers upon layers of justifications reinforced by group think. There is a ton of evidence from history to testify to this. It is not even a prophecy. It is a certainty. I only hope the Chinese will race ahead of us on this road and give us an unforgettable train wreck lesson before we smash into the wall ourselves. I am just thankful we are slower than them because of our British bequeath. Patriots please check our brakes and use them when the government act funny. That's the future, meanwhile the government will find itself having to live with shrinking policy space. Trust is directly proportional to policy flexibility. Witness growing NIMBYism here. I am puzzled why they would not want to build and deepen trust with us. It will make this place so much easier to govern. Who can I ask to explain this to me? I can only think of stupid irrational answers. I saw how very smart mandarins became ossified in their thinking and lose flexibility at the twilight of the Qing Dynasty. Every nation that has fallen, has fallen from within. None of us want to be the Nouriel Roubini of our nation. On this, we prefer to be mistaken. Daughter reminded that there is too much negative energy in Singapore. I hope this brings some relief. A YouTube video on killing sacred cows. My birthday lunch at Ichiban Boshi @ Centrepoint today. Midway through lunch I was surprised to discover that my secondary teacher posted her birthday wishes to my Facebook Wall. I am always surprised how much teachers are able to remember of their students especially when I do not share the info. I have also been turning down all requests to join a popular birthday tracking app. I see, revising Chemistry is her birthday gift. LOL. The reason is she studies so little otherwise. Going all out for exams excellence is easier than striking a good balance. Top grades are not the be all and end all. The purpose of education is freedom. Ignorance would invite bullying especially from the government. Often people don't even know this is happening. It only becomes obvious when it is too late, i.e., when they are powerless to right the situation peacefully. But there are early warning signs when government repeatedly under perform. When the exercise is complete, they will consistently under perform as in the Philippines and the too many nations to list here. To my children: Political freedom is not as important as economic freedom, i.e, a job or as an entrepreneur. But up to a point there can be no economic freedom without political freedom. The most important knowledge are the ones stuffed with lies and errors that you have to clear away e.g., Economics, Investing and Business. Those untruths if mistaken as truths will keep you a prisoner unaware until the day of execution. Nassim Taleb called it the Thanksgiving Turkey which until the day before the slaughter thought it was very well cared for. That was how so many purportedly well educated people were scammed with timed to fail financial products. You have to figure it out and find wise mentors like Sun Pin had. All these make life very exciting. Never be bored and but always remain patient. There is a sweet spot in the tug of war which you must find on your own. Test everything including your parents' notions. Learn what Jesus was up to in the Gospels. Get to know him because He lives. Sim Ann's shows her inexperience and insensitivity posting something like this on her facebook page. Don't you know that words often carry baggage? You are a smart woman, a President's scholar and winner of the PM's book prize.What happened? The unstated and primary purpose of the National Conversation is to allow young neophyte highfliers like her to learn the ropes quickly. She will learn and also grow to understand more deeply what it is to be kind and to love. You don't "do or show a little more love or kindness" which is how character education is taught in our schools. That never worked, it only create the appearance of virtue. It is hypocritical. You only get it right if it comes from inside you. Good and sincere politicians sooner or later must discover that if you have to tell a lie (the hazards of a life in politics), be prepared to live the lie such that it is no longer a lie. You can start with "doing kindness and love" but take that as the first step to eventually opening your heart to kindness and love. With time but not practice (that's hypocrisy and insincerity) the heart changes. Now removed from the present toxic milieu, the joke is actually quite funny. Problem is that you just cannot divorce them from its context. It would be meaningless. Therefore the only time this joke is publicly safe is when those who cow-peh and cow-bu are frowned upon by most of society. They are spoilt. Unfortunately people now have many valid reasons to cow-peh and cow-bu. Just name one: the frequent trains break downs. Indeed Sim Ann has a long journey herself to learn to love and be kind. You don't do love, you learn to love. You see love in action somewhere, hopefully at home and then you catch it. It is all learning by catching. The best way to get that is to be loved first and then somehow you are able to pass the love on. You can quicken the learning not by repaying love but by paying forward. It is politically expedient to fake love and kindness through duty and discipline, but that is foolish. This government tend to be expedient than substantial over matters that are more spiritual or intangible. A related and more concrete example is religious and racial harmony. I worry that we have been faking it. Perhaps that's why LKY said we cannot have a non-Chinese PM for a very long time. The Americans take the bulls by its horns; very messy but with less hypocrisy. The product of that is the black President Obama. If you fake it, i.e, you are insincere, people can sense it even if most cannot articulate it. The absence of light giving penetrating words versus heat from cow-pehs provides the fakers the space to continue being willfully blind. Nevertheless the leaders will eventually get it but often when it is too late. Now if looking yourself in the mirror is too unbearable, just watch the hypocrisy of the CCP leaders in China. They professed to love and care for the people but in return they are hated more and more over time. Leaders who had raised the standard of living of the Chinese that no emperor before had even come close. 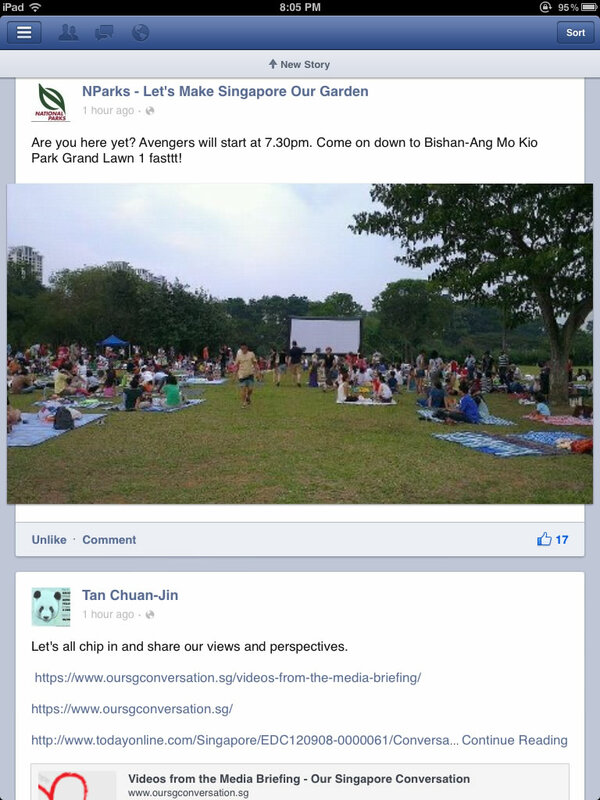 Wonderful idea from NParks. Honda has been doing this too; screening open air block buster movies. Quite fun once in a while to have this. I recall as a kid, the times when my parents could afford a car, we sometimes went to Jurong Drive-ins. The first time was novel and fun but after that, we prefer to go to the regular theatres given the uncomfortable humidity. 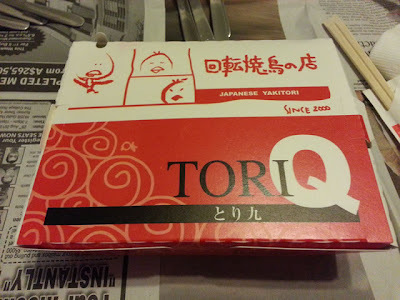 That's why Jurong Drive-in folded long ago. Braddell View: Clean Your Own Estate? Economist: Why so few babies?